High-flying rapper Khaligraph Jones has opened the doors to a potential collaboration with his longtime rap archrival Octopizzo. The O.G, who is back in Kenya from the United States of America where he was awarded the Best Rap Artiste in Africa during the Afrimma Awards, says the award has changed his perspective and he’s ready to work with anybody, including the Kibera Namba Nane rapper. “Before this (winning Afrimma), I used to think differently. I am not the same anymore. 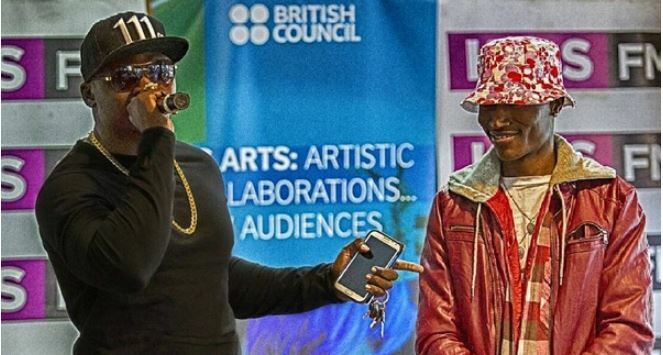 I can do a collabo with anybody…anybody,” he responded when asked if he was ready to do a collabo with Octopizzo. Khali was speaking during a live TV interview over the weekend, during which he also slammed his haters. He even released a freestyle track directed at his naysayers. “This is not something I like doing on TV, but I am here doing an interview and scrolling through my phone, I see some people going online asking why I am behaving like this…asking if I am drunk. I don’t even drink…this industry is full of hate…,” said Khaligraph.